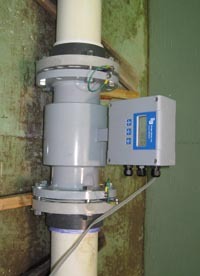 Courtesy photo This is an example of a water-measuring device that has been approved by the Idaho Department of Water Resources. Beginning April 1, well pumpers irrigating more than half an acre in Blaine County will be required for the first time to account for how much groundwater they use. State law allows well users to irrigate up to half an acre without a water right or a measuring device. An order issued by the Idaho Department of Water Resources in September 2011 regarding Blaine and Camas counties stated that those using wells to irrigate five acres or more would be required to have department-approved water meters installed and operational by April 1. Those irrigating from half an acre to five acres must submit a plan by April 1 for installing an approved water meter by April 1, 2014. Department hydrologist Corbin Knowles said the department will begin regulating 685 wells in the Wood River Valley and on the Camas Prairie. About 300 of those wells are used to irrigate less than five acres. Knowles said violations of the orders can result in civil penalties. Knowles said all well users in the area have been assessed fees to cover the cost of department reviews of plans and measurement practices. These include a minimum $50 fee per well, and fees of $32 per cubic feet per second of water flow. Knowles said measuring a flow of 18 gallons per minute would cost about $52 per year. “Our goal is to keep costs under $1,000 for users between half an acre and five acres,” he said. The 2011 order marked the beginning of a water measurement district in Blaine County, a precursor to a water district, which could more strictly enforce the priority of water rights under conjunctive water rights administration. Conjunctive administration would manage surface water rights along with groundwater rights, possibly curtailing the latter in dry years, since groundwater rights are often junior to older, surface water rights. A groundwater flow-modeling project kicked off last week by the U.S. Geologic Survey and the Idaho Department of Water Resources will also contribute to an understanding of the relationship between groundwater and surface water in the Wood River Valley. Knowles said groundwater has been measured elsewhere in southern Idaho for nearly 20 years. He said the practice could eventually help well users in Blaine County avoid costly litigation in case senior water rights holders downstream place a “call” to curtail groundwater water use in the Wood River Valley. Knowles said several business groups spent about $40 million over a 10-year period in the Magic Valley to buy senior water rights to keep fish farms in production. “One group paid at least $7 million in litigation costs alone,” he said. For more information, call Knowles at 208-287-4842.